It’s over, Mr. Kavanaugh, I’m breaking up with you. It was great while it lasted, but it's over. Our six month stint as BFFs has come to an end. I was loyal. I sang your praises. I believed, in the face of all evidence to the contrary, that you knew best. 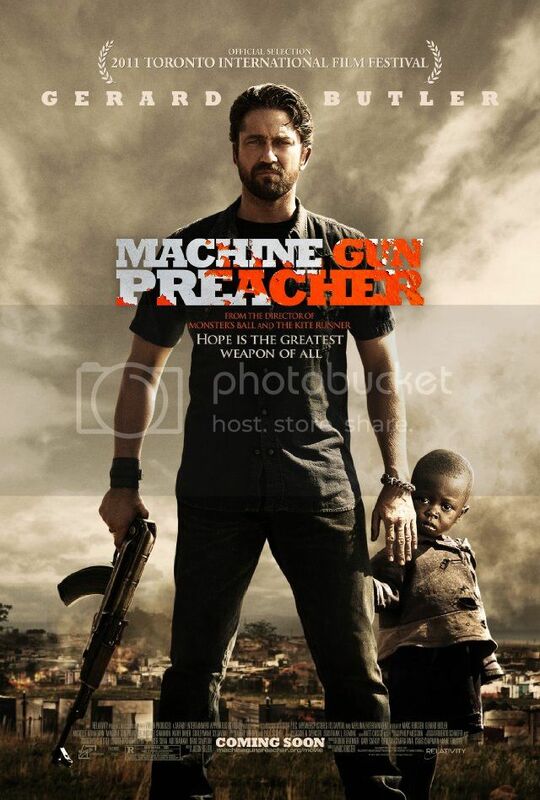 When Relativity Media took Machine Gun Preacher off of Lionsgate’s hands at the behest of director Marc Forster, you told the world it was for the express purpose of releasing it in 2011, with an eye toward award season*. This comes directly from your press release at the time and no one (arguably) was more thrilled than I was. (I did the “demented poodle dance” on this blog for you!) So what happened? Were you just placating Forster? Or was it for your good friend (and the film’s star as well as one of the producers) Gerard Butler? Does one of them have incriminating photos or literally know where the bodies are buried? Was it always your intention to just open the door and let the film wander through it rather than shepherd it lovingly along its path to public awareness and hoped-for butts in the seats? After having witnessed the almost complete lack of support you’ve shown the film, I have to ask, “why?” Why bother? Did you lose faith somewhere along the line? Did you lose your wallet? There was no trailer, no poster, no advance word of any kind until about a month before release. Then came the Toronto International Film Festival. Those of us who follow such things breathed a sigh of relief because we thought, “Okay, now it will begin. The film received a standing ovation at its world premiere. Surely the great minds in charge will build on this momentum and we will see a show of support.” Butler, along with his costar Michelle Monaghan and even the real Machine Gun Preacher, Sam Childers, crisscrossed the country stumping for this movie. No matter how many times they were asked the same questions, they responded with enthusiasm and a visible pride in their product. The problem is, I know all of that because I’ve been following the journey of this film since it was announced that Forster would direct and Gerard Butler would star, which was nearly two years ago. If I hadn’t been, it is entirely possible that I still would not know anything about this film. You’ve relied almost entirely on word of mouth and a grass-roots internet campaign by Gerard Butler fans to publicize this movie. And we have tried. We have done everything that has been asked of us and more and we’ve been doing it for weeks. Supposedly you’ve been listening, but where’s the proof? Now that it is slinking out of theaters in the larger markets, even before it’s had a chance to slip into the smaller ones, I, for one, am left to wonder what the hell was the point? Do you have any idea how hollow it feels to have talked this movie up to anyone who’d listen and have nearly every single one of them say, “I’ve never heard of it”? Now that they have, what difference does it make since it’s no longer available to them? I’ve gone so far as to buy tickets for other people because it was a physical impossibility for me to be in the theater any more than I already had been and yet I wanted to continue to show my support. I felt an obligation to show my support because I believed so strongly in the film and in Butler’s performance. Why didn’t you? Well, apparently it’s all about the money. If Machine Gun Preacher does well, you’re afraid it might queer your deal with JP Morgan**, that your current financial partner, Elliot Investments, might not go gently into that good night and might stick around like a burr under your saddle. But, if MGP tanks and you can close with Morgan by the time your next release, Immortals, comes out, you’re golden and that movie’s success will prove it. So, you took Machine Gun Preacher off of Lionsgate’s hands and appeared to all the world like a savior. I’m reminded of Leo Bloom and Max Bialystock (Mel Brooks' The Producers). In this case, when you (and whomever you’re in cahoots with) realized MGP might be a success you decided to blow up the theater, but you forgot to tell Gerard Butler, Sam Childers… and the fans. You let everyone think that Relativity’s involvement with Machine Gun Preacher was a show of faith in the movie, the director and the star’s incredible-enough-to-be-a-personal-game-changer of a performance. (Business aside, you’d think you’d want to support a friend. For God’s sake, Gerard Butler was in your wedding party!) Instead, it looks like you tanked your good friend’s movie…on purpose. PS: Unless Hunter Killer is the mother of all submarine movies, with a role as meaty and exceptional as that of Sam Childers, it will not make up for the torpedoing of Machine Gun Preacher. PPS: Box Office Mojo reports that as of 10/11*** MGP has made $325,65.00. That is a disgrace. At this point, it will have to work to catch up to the domestic take of Beowulf & Grendel, a little seen, barely released retelling of the epic poem, although it might catch Game of Their Lives (Miracle Match), a little seen, barely released movie about the 1950 US Men's Nat'l Team & the World Cup, both of which were released in 2005. Dear Frankie, which had almost no domestic distribution made nearly 1.5 million. WTF is wrong with this picture?? Even Gamer, which incidentally was released by Lionsgate, had a lot more PR and made a lot more money. Love 'em or hate 'em, Gerard Butler movies make money, especially those released after 2007. While I realize that this won't be the first film to have been scuttled by a lack of studio support or publicity, it is, just maybe, the first one that I care about this deeply. …and the rest will follow." That said, there is a film that I really do need to write about. 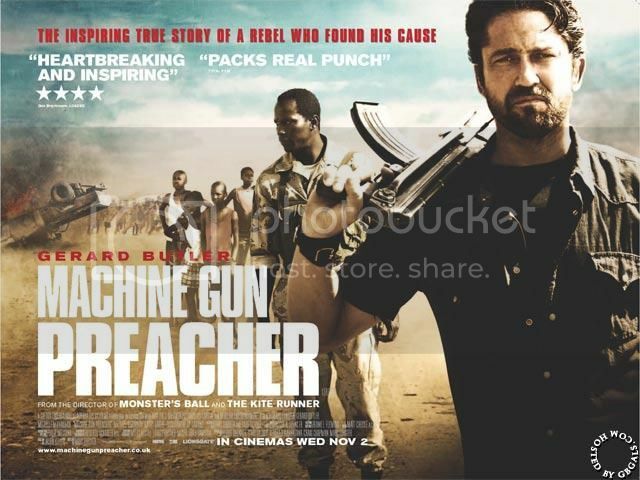 I’ve been thinking about Machine Gun Preacher for the past few days, okay a week actually, trying to find a fresh way to talk about this film, but I’ve decided that I just need to sit down, free my mind and start typing; that by waiting, my silence could be misconstrued . I need to write about Machine Gun Preacher and I need to write about it for a lot of reasons, but let’s start with the most immediate. I need to do my small part to get the word out. I want my friends to be able to see this movie. I’m lucky that I live in a large metropolitan area so my city was part of the 2nd wave. After the first “soft” open in NY and LA, Boston was one of the places that got it next. I’ve now seen it four times and I have no doubt I’ll see it again. In order for the distributors to be able to take it to more theaters, it needs to make some dough, some clams, some smackers, some somoleans. So I bought four tickets. I’ll buy more. I’m not lining anyone’s pockets. The producers of this movie (of which there are many) didn’t make it for the money. They’ll be lucky if they see a dime. But today’s receipts have to pay for tomorrow’s release. This brings me to my next reason. Machine Gun Preacher is intense and it will haunt you. Gerard Butler is nothing short of phenomenal. For the first time since I became aware of him, I stopped seeing G, despite the fact that I know what Sam Childers looks like. He just became the character. The movie depicts violence with unflinching candor. It weighs the good religion can do against the bad that men can do and leaves the final judgment to viewers (and gives them credit for their intelligence and ability to do so.) And because I've been following all of this so closely, by the time the pics of the real Sam, (along with Lynn, Paige, Deng and the kids) came up with the credits, it felt like I was seeing a friend. I love the way the camera pulls up and away for the parting shot, leaving Sam standing amid the children on the desolate African plain until he ultimately becomes a speck on the landscape. It reminds us to keep the big picture in mind. I know you’re shocked that I liked it, (she typed sarcastically). I’ll concede that I’d be hard pressed to truly dislike a Gerard Butler movie (including The Bounty Hunter. We’ve talked about this. I have my reasons), but I don’t think I was prepared to be as affected by Machine Gun Preacher as I was, as I am, as I will continue to be. The first time I saw it, despite the fact that I was looking forward to it so much that I had purchased my ticket a full month ahead of time, my head was swirling with all of the negativity that I’d been reading in the week or so before it was released in Boston. Whenever there was a scene I'd read something about, all I could do was compare what I’d read to what I was seeing. It distracted me from fully experiencing the movie, not to mention left me wondering where the derision was coming from. The second time I was able to just let it wash over me so that I could absorb it. I think it affected me even more that time, despite the fact that I knew what was coming. It's not something one (or at least I ) can shake off easily. The film opens with a scene of incomprehensible brutality and then quickly cuts to the seemingly more mundane life of a reprobate getting out of prison. Even as we bear witness to the brutal thug that is Sam Childers as he interacts with his family and wastes his life in a drug fueled haze, the specter of that other scene hangs over everything and we wonder where and how the two will intersect. Sam’s life very quickly (in movie time) spirals downward to rock bottom.The majority of reviews I've read can't, or won't, even keep the timeline straight. Sam did not find religion and start his church. He found religion, a number of years passed and he went to Africa on a service mission and when he came back from his first trip he made plans to build a church and build his orphanage. It needed to happen quickly. Did we really need to watch Sam shoot up in the bathroom of a biker bar more than once to understand who and what he is? By the time the catalytic encounter with the drifter occurs, we understand how bad he is. It is a testament to Sam Childers that he has the strength to reach out to his wife at that point and a testament to Gerard Butler’s abilities as an actor that we feel his pain. We also feel his confusion and trepidation as he sits in church, debating whether or not he’s worthy of baptism and accepting Jesus into his life as his savior. The phrase “nervous as a whore in church” came immediately to mind. Time passes and it becomes evident that Sam has turned his life around and has devoted himself to making a better one for his family. Whether or not this is because of God is almost irrelevant. It is certainly because he’s kicked his drug habit and changed his ways. Anything that helped him with that is a good thing, no matter what you believe. Sam believes it was God. He also believes that God wants him to help others and he starts with his best friend Donnie. (Much has been made over the fact that “Donnie” is not an actual person. Let’s not forget that it is a movie. Some things are embellished for dramatic effect, time is compressed, real people become composites.I think there’s a lot of Sam and Lynn’s unseen son in Donnie- a brilliant Michael Shannon-, who suffered a similar fate.) If you’re watching a movie about the 100 Years War, it’s not made in real time. Sam Childers is painted in broad strokes because otherwise it would have been a six hour movie.The quest to build the orphanage threatens to consume him. He neglects his own family, including daughter Paige (Madeline Carroll. It is to her credit that she manages to deliver the film’s most predictable and ridiculous line with enough real emotion and depth of feeling that we buy it), and remains as difficult and self-destructive as he ever was. I don't think it was ever his intention for the African part of his life to overshadow his life at home. When he returned from that first missionary trip, he had enough energy and zeal for both. In truth, I think that there is probably another movie that was left on the cutting room floor and a lot of the problems that a lot of people had with the film could be fixed with better editing. There were some aspects that I would have liked to have seen more fleshed out, such as Lynn’s struggle back home. We’re asked to take her acceptance of Sam and his mission on as much faith as she apparently was. The scene with the phone call where Lynn is in the pristine grocery store at home while Sam wanders amid the chaos of a Sudanese town, after the LRA has burned down his newly built orphanage, says a lot about their relationship. Presumably Lynn hasn’t been to Africa yet, she has no real idea of the conditions there or what Sam is actually going through, but she knows he needs it, needs to be there and needs to rebuild as much as the children do. That makes her fears and her despair for what it eventually does to him all the more poignant. It’s tempting to say that some of the scenes in Africa could have been tightened up or ask if we needed that many to understand the struggle. Ultimately I have to say, yes we did. Every one of them propels Sam along his road. But I also feel that the majority of the people that didn't like the movie are all sounding like broken records. They are like a rock skipping over the surface of a lake (to REALLY mix my metaphors) refusing to go deeper and refusing to see what's really there. They all read like they made up their minds before they saw the thing. Even the responses to the review on the NY Times website called out the critic for trying to pigeon-hole the film (as well as trying to be clever) by reviewing it based on their expectations as opposed to what's on the screen*. One of the movie’s greatest strengths in my eyes is what is being called a weakness by many others and that's that it does not take you by the hand and lead you to conclusions. It lets you make up your own mind. Like I said in my last blog post, any critic’s opinion is still only their opinion and everyone is entitled to their own. The problem is that there are a lot of people who read these opinions and then their minds are already shaped before they’ve seen the film. I don't think that I'm giving anything away when I tell you that there are a couple of lines in the film that, to me, sum up Sam’s arc, at least in terms of the movie. Deng asks him what he’s “looking for in this place”. At the time, Sam either doesn’t know or isn’t able to articulate what we as an audience can guess, but Sam answers “I ain’t lookin’ for nothin’.” Later, after he’s opened himself up to his purpose, he tells William, probably because he thinks William doesn’t speak English, “I’m scared that one day I’ll close my eyes to all a’ this and let it be someone else’s problem”. William, by the way, played by Junior Magale, is just the most beautiful little boy with the most expressive eyes. His awe of “the white preacher” is writ large on his face, which makes his discovery that he can be of help to this man, that he is needed, so powerful. After four viewings, I still sob at their ultimate scene together. A number of people have asked me, considering all of the talk surrounding this movie, whether I think this actually has awards potential. My answer is that the movie itself is too flawed. G’s performance, however, is definitely worthy. Gerard Butler plays Sam as complicated as well as courageous. He’s forceful and maybe even a little crazy. G is in virtually every scene and there is always something interesting going on. We have only to watch his face or look into his eyes to know where he is at any given moment. He takes Sam from humility to protectiveness to raging, out of control hostility and borderline psychosis and back again. This is G’s movie all the way. If you don’t buy his performance, you don’t buy the movie. I have to say, I love the score for the film as well. I was already a fan of Asche & Spencer and their soundtracks for two other Forster films, Monster's Ball and Stay. 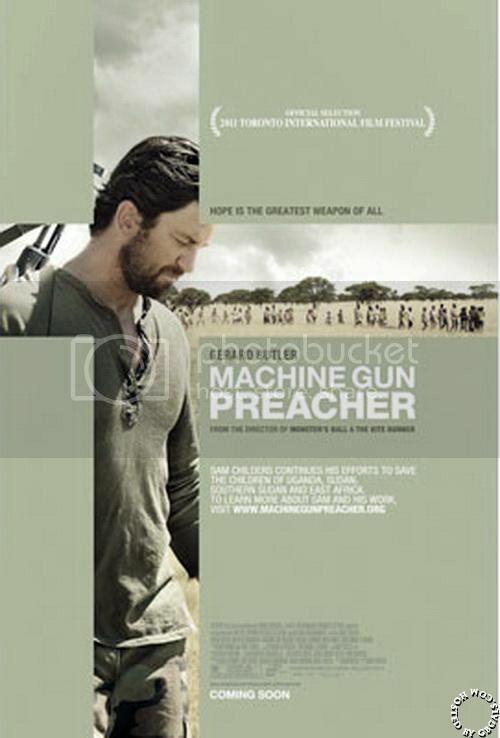 The music for Machine Gun Preacher is, for the most part spare and lean, acting as a thread that weaves in and out of the narrative without being intrusive (just as a good score should do), but it's also got some memorable themes and when it swells during the final shot, it moves me to the point that I have to remember to breathe. There is a documentary in the final stages of post production on the life of Sam Childers. While many have suggested that that format would have better suited the life story of so complex a character, the irony is that without this film and the publicity generated by it, the documentary probably would not have the chance to be seen by anything resembling a wide audience. The real Sam has said that he's not afraid of dying, but he wants it to be 'for' something. I get that. Right this minute, I feel like I need a purpose. Maybe it’ll pass. I hope not.